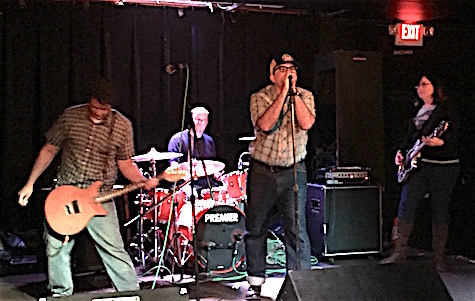 Wagon Blasters at Lookout Lounge April 30, 2016. The band plays tonight at Brothers Lounge. It’s been too long since the last Wagon Blasters 7-inch came out — like five years too long. Well, they’re back on vinyl with a new 7-inch, Pandamonium Paradise E.P. (2018, Speed! Nebraska), four geetar-powered tractor punk ditties that are sure to be the soundtrack to the hottest summer on earth. You can pick up your copy tonight at The Brothers Lounge, where Gary Dean, Jesse, Will and Kate will be rifling through the new songs and a ton of old favorites. The sea-glass vinyl record is limited to 300, so you better get yours quick. If you can’t make it to the show, you can order one online at the Wagon Blasters’ fancy new Bandcamp page that not only features their full discography by a boatload of Speed! Nebraska merch including new seed caps and super-fast-looking racing-stripe Tees (I need one of those in large, Gary, make it blue). Joining Wagon Blasters tonight is fellow Omaha act The Broke Loose and Lincoln pals Domestica. $5, 9 p.m.
Also happening tonight is the debut of The Candy Boys — the new band fronted by John Klemmensen (which you read about yesterday) — at fabulous O’Leaver’s. Joining them is Not Funny and Not Ben Shin. $5, 10 p.m.
Saturday night Almost Music in the Blackstone District is hosting an in-store concert with San Francisco jangle-pop summer-of-love band The Love-Birds. Dayton noise act Stress Test opens along with Omaha’s favorite psych-rock troubadours David Nance Band. $5, 9 p.m.
Sunday night Bazile Mills plays at Reverb Lounge with The Ruralists. $7, 5 p.m.